To accomplish great things, we must not only act, but also dream, not only plan, but also believe for victory is always possible for the person who refuses to stop fighting. 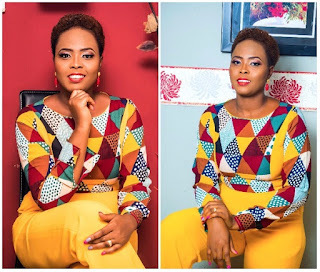 Laila Ijeoma, CEO, LailasBlog has indeed carved her name in the sands of time and she has countless proven to us without doubt that she's truly a fighter who isn't afraid to lose but constantly believes she'll win the battle someday with God on her side. I started blogging as a joke in 2012; I wasn’t looking for money because I was already gainfully employed at that time. All I wanted was an outlet to share my life with Nigerians, inspire them with my stories. So I started a Facebook group called, ‘True love for my man’- that should be around 2010. Nigerian talk show, so I later started a show on radio. I eventually had to put it on hold because it was so demanding. Being married, a mum to 3 boys, working at the bank, there was a lot to do in just 24 hours every day and the whole schedule nearly ‘killed’ me, so I had to drop the radio show. Along the line, I discovered blogging through a colleague at the bank where I worked; he owned a blog, after he introduced me to it that fateful day, I got hooked. I realized I could reach out to people through it with much less stress compared to a radio show. I told him I would love to have mine and he helped me set it up. I didn’t even take it serious then. But as I kept on sharing stories, and I read comments from my audience, I knew this was what I was born to do. I have always been a science student in school, I knew nothing about blogging, and I had zero celebrity friends, zero celebrity sources for my stories but I didn’t let that stop me. It was a crazy, hectic schedule! On a daily basis, I wake up 4am; go to bed sometimes 12 midnight. And the next day, I still have to go to work. No excuses. I was able to run my life like that for four years because I was purely fuelled by passion. I just love blogging, there’s this irreplaceable, beautiful joy it brings me. As with every new venture, the beginning is usually slow. recognised as a voice that can start a change. You are respected. People want to read what you have to say about a situation. Readers are so addicted to your blog that they wake up in the morning and can’t wait to read what is on Laila’s Blog today. As a blogger, you can comfortably work from home in your pyjamas. I did banking for 10 years in one of the best banks in Nigeria and I enjoyed it. But I wasn’t self-fulfilled, I wanted more. Again, I was already blogging for over 3 years alongside my day job. Truth is as time went on, it became harder running my blog, bank job, family and taking care of myself efficiently. I wanted to wake up in the morning to the joy of knowing that all I had to do for that day was write about the trending stories in Nigeria and not miss any story just because it happened while I was offline. I also wanted to spend more time with my very supportive husband and children every day. It has been tremendously rewarding, spiritually, family-wise, and financially. You know with a steady day job, you don’t have to worry about getting your paycheck at the end of the month. There are days I worry- what if I don’t make money this month? That was why before I quit my bank job, I made sure I saved up my salary and had at least 6 months’ salary set aside. I actually had a full year salary saved up before I made the leap and resigned. Five years from now, I see more younger people doing big things, conquering boundaries, becoming millionaires through blogging in Nigeria. I also see blogging in Nigeria becoming more professional. I am a registered member of this CAC registered bloggers’ association called The Guild of Professional Bloggers of Nigeria. These new bloggers apply for AdSense and most times, they are rejected and you see them quit blogging. From the day anybody starts blogging till the day he/she ends her blogging career, there are lots of problems you’ll face. Solving these problems and moving ahead is not easy as it sounds! And that’s another reason upcoming bloggers quit blogging easily.